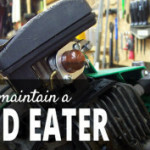 Home Blog Weed Eater What is the Safest Way to Use a Weedeater? Initially, you need to be familiarized what weedeater machines are. 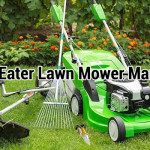 Weedeaters are portable lawn care power tools also known as string trimmers, weed wackers or simply whackers. These equipment devices are used in trimming and edging your lawn and other similar land structure with a grassy condition. They do not use blades to cut grass but use flexible monofilament line similar to a fishing line only thicker. The following topics will guide you on how to be safe starting with your PPE or Personal Protective Equipment. Next to it is the step by step safety guidelines alongside with the weedeater’s uses and functions. Wear safety glasses that are certified to withstand shattering in severe cases and will surely protect your eyes from debris everywhere. There are also safety glasses with side shields designed to be worn over your prescription glasses. Make sure to replace safety glasses when they become filled with scratches or become brittle. 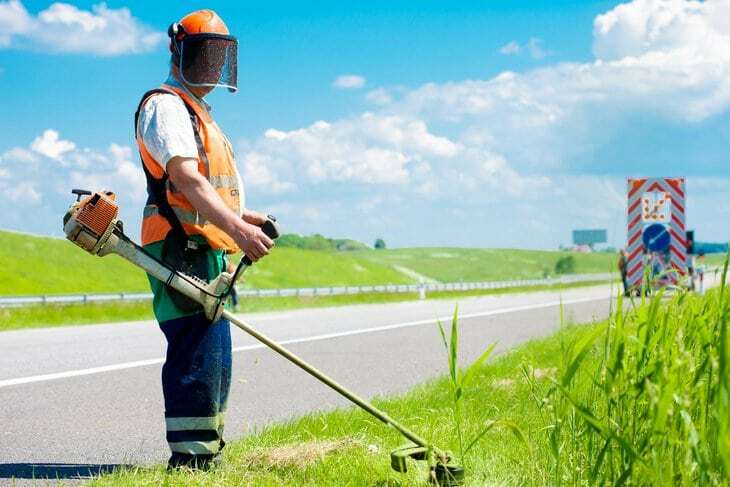 Face shields are recommended if the grass area is heavy and flying debris is expected probably due to wind or effect from trimming on open areas. Safety glasses sometimes become insufficient and a backup cover is needed. Wear high-quality dust masks suitable to the task you are about to perform and when exposed to concentrations of dust and/or airborne debris. Do not wear the mask when it is already worn out or damaged as it will compromise its ultimate purpose in deterring the dust particles and other elements. Depending on the type of machine you are going to use, always make sure your ears are also protected. Extended exposure to noise can result in hearing problems. Use earplugs or earmuffs in these work environments. Use work gloves with the proper thickness or rubberized linings appropriate to the machine being used and based on your hand’s sensitivity. Tough and closed shoes are required. You might be working on areas that have potential hazards, especially when you are moving the objects away from your work areas. Work shoes appropriate for the type of work being done are needed. Open-toed shoes or sandals are not safe to use. You might need to wear boots or long socks to cover your entire feet and legs from crawling insects in the area of work. Hardhats are needed and ideal for every construction type of work. Grass trimming may include moving large objects and you need to have a projection from possible head injury or falling objects & debris. You may also include an absorbent fabric head band to keep the perspiration from running over your face. Safety vests will make sure that people can notice you while you are using tools that may cause hazards to them, especially if there are several individuals working with you. Wear safety vests or high-visibility clothing in your work area. Gear up and wear all necessary Personal Protective Equipment (PPE). Tie up if you have long hair or use a hat and hairnet and make sure to keep it away from the engine or motor of the weedeater. 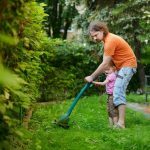 It is safer to let the grass and weeds dry out before trimming. Grasses are lighter when they are dry. Hold the trimmer right and tight with both hands. Make sure it is on the right side of your body so that the muffler and smoke is away from your face. Keep your left arm straight and allow your right arm slightly bent and flexible. Stand upright and place the trimmer at the same level of your waist. Start and move slowly, initially to feel the force of the machine while keeping your position steady and firm. Do the cutting from right to left while keeping the debris away from you. 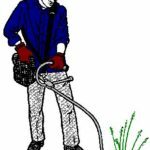 Continue cutting from top to bottom especially if the grasses are long and thick. The motor will not be stressed out and so as your arms and legs. Slowly tap your trimmer’s bump knob to the level ground to release more line to avoid engine stalling. Allow the tip of the line do the trimming and not the middle part. It is most effective using the line tip. When the string breaks down or gets damaged, just run the machine at a high speed and slowly bump its knob to the ground to release an extra trimming line. The trimmer line might get damaged if it hits anything hard like walls and metal objects. So make sure to hit the grass and weeds only. If it hits hard objects, stop the machine and double check your line trimmer for potential problems. Cutting around the trees, fences and posts are more challenging since you do not want to damage any of these including you trimmer. So rotate your trimmer to a 90-degree angle from the ground to make a more precise trimming. Do not use string trimmers to cut grass against the trunk of trees. Doing so might kill the tree if the monofilament line cuts the bark of the tree. Before you head on and begin with your trimming task, applying precautionary measures is a must. 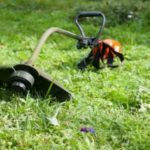 It may seem like a common backyard or outdoor chore on a daily basis, but using a weedeater to edge your lawn and cut the growing turfs down still require an utmost preparation to prevent any accidents and any damages to your equipment. Regularly inspect your PPE (Personal Protective Equipment) for optimum safety conditions to make sure you are getting the right benefits from those shields. 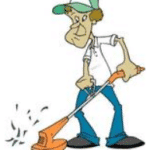 Safely disengaged your weedeater or trimmer and carefully place it away from individuals especially children that might bump onto them and cause accidents or even damage to the equipment. Always leave your workplace clean and neat and free from potential hazards to passersby and co-workers. There is nothing can compare to having the job done completely and safely if you follow the steps and precautions discussed herein.